April is National Pecan Month. In Florida, pecan trees are found in all regions between Pensacola and Miami, although about half of the acreage is found in north Florida. The acreage of pecans exceeds all other deciduous fruit in Florida combined. Florida produces from five to ten million pounds of pecans annually, according to the University of Florida. Pecan trees are very large and can reach up to 70 or more feet in height and six feet in trunk diameter. Trees mature and produce nuts after 10 to 12 years. UF/IFAS pecan trees can be successfully grown in a garden when cared for properly. In Florida it is suggested to plant pecan trees in the colder months (December through February) to allow root growth before spring. Pecans are a natural, high-quality source of protein and are sodium free. They contain more than 19 vitamins and minerals and have more antioxidants than any other nut variety. 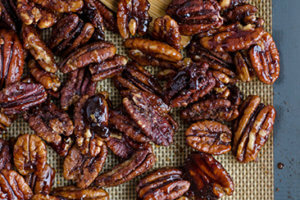 Pecans can also help reduce the risk of heart disease and lower cholesterol levels.